My family left Akron, Ohio when I was in the third grade, but we continued to return on a fairly regular basis for a long time thereafter to visit with relatives. It was on one of those visits that I was able to make my way to the Rexall drugstore a couple of blocks from my grandparent’s house to check out its comics spinner rack. It was there that I found issue #115 of The Flash. It was the first Julie Schwartz edited book that I picked up, and, once onboard, his books became my only destination for a long time thereafter. I was immediately captivated by the writing of John Broome and the artists Carmine Infantino and Murphy Anderson. It’s impossible to exaggerate the impact that their amazing work had on my budding cartoonist ambitions. A couple of years later, I would also find a copy of Amazing Fantasy # 15 which contained the first appearance of Spiderman on that same spinner rack, but I eschewed it in favor of the latest issue of The Flash. I was nothing if not loyal. With my second comic book cover homage/pastiche in Funky, I got to spotlight those two artists who first lit it up for me. Bright stars to steer by as I made my journey. Not long ago, Carmine Infantino passed away and the heavens are a little less bright these days. 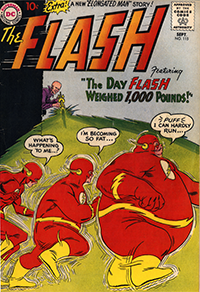 Issues of Amazing Fantasy #15 have sold for north go $50,000, but I wouldn’t have traded a single one of those issues of Carmine’s Flash for it.